I love my Oster Toaster Oven with Convection Cooking. It is like having a second small oven in my kitchen. I asked for this as a Christmas gift, thinking it was just a toaster oven. It is so much more, and I was pleasantly suprised the first time I used it. The features on the oven are easy to use. It bakes, broils, and toasts fabulously! I often use it to make side dishes when my main dish is already cooking in the regular oven. However, I've also used it to cook meats such as sausage balls. It does everything my regular oven can do! I agree with other reviewers that it has a large interior, it is easy to clean up, and it is stylish enough that I don't mind keeping it out on my kitchen counters. I also agree that it does take time to heat up; this is not a fast process. However, I would recommend the Oster oven to anyone who needs some extra oven space in their kitchen! I really like this toaster oven because I often find myself needing to use the oven for things that don't take up much space. I feel like using this always speeds up the preheating process and also saves me a whole bunch of gas. I love using this when I need to heat something up, but microwaving it would destroy it. Something like fried chicken or pizza where I prefer to keep it crispy. It saves me a whole bunch of time and it has all these different options to use. 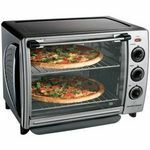 I think its also a pretty good size toaster oven, the large interior even can make a pretty good size pizza in my opinion and I always bake my cupcakes using this. It takes me another round to do the 2nd batch for about 12-18 cupcakes each round. Usually I'm just heating something up for myself. It's really easy to clean and I haven't had any problems with it. I think this has really good quality and it's a really good size since I've seen some really small ones. Why have a small one when you can have a slightly bigger one to widen the options for the things you can put in there. Sometimes my mom even cooks a small/regular size chicken in there! The Oster Digital Convection oven provides a perfect pinch-hitter in the kitchen. Due to its smaller size, in the summers it can be an indispensable cooking appliance--it has ample size for a small family meal without overheating the entire kitchen. 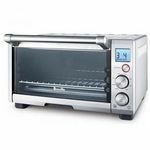 It performs all the basic functions of a large toaster oven, but add in the convection feature and it is a very well-rounded appliance. In the "bake" setting, it can go to 450 degrees, so if your recipe calls for hotter, this will not do. It seems to pre-heat fairly quickly (1-2 minutes) and cooks evenly--no hot or cool spots. As an everyday toaster, it's a good size for an average family, with two full racks that hold about four regular sized pieces of bread each easily. I added a non-stick pan liner to the bottom, so clean-up is a piece of cake. The only area that can get tricky to clean is the glass--there are a few little nooks that may collect grease and crumbs. The only other down-side is that the timer requires you to use an 'up' arrow to set the time; so, if you have a long cooking time, it will take you awhile to set it. I would recommend future models to allow you to set the time as you would on a microwave. 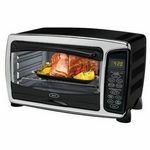 The Oster 6248 is a small convection toaster oven that is a wonderful addition to any kitchen. It has a digital display and four different modes of operation: bake, broil, toast, and keep warm. 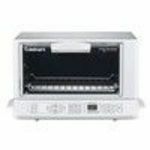 It also features a built-in timer, temperature settings ranging from 150 - 450 degrees, and a good-sized cooking rack for a unit of its size. 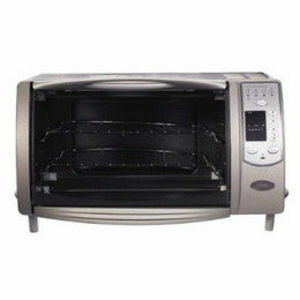 The pros for this product are the large internal space, even heating, convection cooking, and an easy to clean interior. This appliance is wonderful to have for quickly making smaller batches of food without having to take the time and electricity/gas to heat up a full-sized oven. I have used this unit to make everything from chicken fingers to hamburgers to pork chops to fish. I have cooked a full main course for 5 people using it. It is even large enough to bake a pie in! While the manual says not to use foil inside of this toaster oven, I have had no issues covering the included tray with foil for easy cleanup. It also sits high enough that it will not make the counter very hot while in operation. I especially like the convection cooking feature for things like pies or small batches of cookies. The only drawbacks are that the plastic label for the touch controls isn't as durable as it probably should be (although mine may be looking tattered simply because it gets so much use), it can take slightly longer to heat up than other units (about 4 minutes). I have also noticed that the convection bake function is labeled "bake" while the non-convection bake is labeled "broil," but this shouldnt be an issue with someone familiar with the unit. 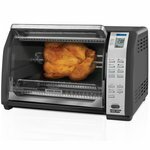 Overall, I would recommend this to anyone looking for a good, solid toaster oven to avoid having to use the full size oven for smaller batches of food. With the minor drawbacks, I would give it 4 1/2 stars.